The concept of budgeting is pretty simple: Create a plan for your money and stick to it. The reality is much more complex. There are countless decisions to be made when it comes to your money. There are periods of unexpected expenses. There are sometimes periods of inconsistent income. But there’s one thing people do when budgeting that can really cost you money. I know this because I’ve been guilty of it. 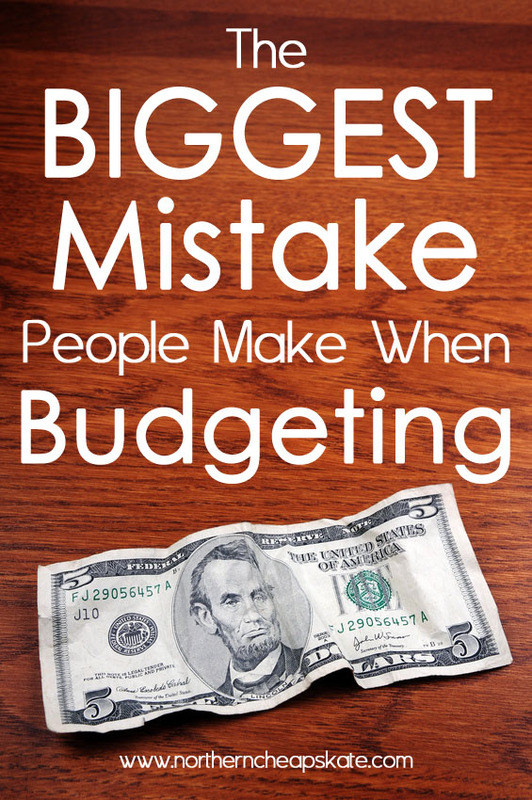 The biggest mistake people make when budgeting is thinking that tracking is budgeting. Tracking is simply keeping track of all the money you spend in the course of a day, a week, a month or year. It’s merely a bookkeeping exercise designed to help you see where you are spending your money. Its goal is to help you establish a baseline for spending. Tracking is not budgeting. Budgeting looks at what you’ve tracked and looks for patterns. It makes you ask yourself how you can reduce spending in a particular area. It allows you to set goals for what you’ll spend your money on before you spend it. Tracking is for after the fact. Tracking means you’ve already spent the money and it’s not coming back. I’ve been dutifully using the budgeting software You Need a Budget (YNAB) for the past year in an effort to better manage our family budget. I have loved using YNAB for tracking expenditures and keeping track of income. It’s an easy to use program that allows you to quickly see a lot of information about your spending and earning habits. I love that it has a mobile app to enter in transactions when I’m on the go. At first, I was put off by the price tag. After all, there are plenty of budgeting spreadsheets and trackers like Mint.com that I could use for free. But here’s the thing: I do not have to enter ANY personal banking information into this software. All I enter are numbers and transactions. I don’t need to give any sensitive personal financial information to a third party. I can download info from my bank and then upload it into YNAB if I want to, but it’s not required. The fact that my data is as secure as my home computer is all the reassurance I need to use YNAB over other free alternatives. If you’re looking for budgeting software, YNAB is worth every single penny. But here’s the thing: YNAB is only as useful as the user is dedicated, and I slipped a bit when it come to using the software to its full potential. Instead of really diving into using it as the powerful budgeting tool that it is, I started to use it more as a tracking tool. Sure, I entered in ballpark figures for all the categories each month – things like electricity, gas, groceries. But I made very little effort to stay within those constraints. Instead, I overspent in nearly every category, taking money out of savings instead of taking a critical look at my spending habits. I was deficit spending. Of course, I tracked it all, and told myself I was doing a good job budgeting. I was lying to myself. Once I realized I was making this giant mistake when it came to budgeting, I knew I had to do something. So I sat down and really reviewed all of my budget categories. I determined which categories may have been under-funded. I tried to see if there were patterns to my overspending in particular categories like eating out. I actually created a working budget. I now have a budget and I am tracking with a purpose: To stay within those budgeted numbers. I’m using the vast resources compiled by the folks at YNAB to help me focus on my financial goals. Despite making the big mistake of confusing tracking with budgeting, I still think that YNAB helped keep me more accountable than if I hadn’t been tracking at all. I think I would have spent much more frivolously if I had not been regularly entering in every single penny I spent. I also think the lengthy period of tracking has provided me with a wealth of information that will help me create a more liveable budget than I had not tracked. Tracking is good. But it’s just part of the budgeting process. Now the real work begins. Note: This post contains affiliate links that help support this site at no additional cost to you. Please read our full disclosure policy for more details. Thanks for pointing out this important distinction. I’ve been guilty of missing it, myself! I am making a bunch of financial goals and writing about it ~ Thank you so much for mentioning tracking. I had wrote down a bunch of what I thought we would typically buy in a month, but didn’t think to actually track it. I found your post on Pinterest and so glad I clicked through! Thank you! Thanks for the tip. I have heard of the envelope system, but didn’t realize there was an app. I love it when you can find something that works for you! thank you for this post. I also use YNAB and I recommend it to all of my coworkers. It has definitely helped me a lot. I am no longer living paycheck to paycheck and a lot of the reason is because I began using YNAB and sticking with it. I also use YNAB. If you get on-line and take some of the courses they continuously give away free software. I won a copy of YNAB and have been using it since. I really appreciate this post and the distinction you make about tracking and budgeting. Sometimes budgeting feels like telling myself no, but when I’ve set aside a airship amount each month, it can become telling myself and! I love that. I think budgeting is so freeing! I also use YNAB and have for the past 4-5 months or so. I LOVE it! It feels really good to know how much I have to spend in each category and I have found that I am not so worried about my spending now. It used to be that I would constantly worry and stress out about how much I was spending. Now, I allocate for what we need (Yes, sometime’s we still don’t have enough for everything we WANT to spend on). Now when I’m at the grocery store and I have $200 in my grocery budget, I’m not stressing and calculating in my head trying to figure out if I am spending too much. I just keep it under $200 and I’m good. :) For the first time in YEARS, I feel like we are starting to get a handle on our finances. Go YNAB Go!